Visitor Badges and Temporary Badges are a must for any facility that allows inside visitors and needs to differentiate them from regular employees. Visitor Pass Registry Books, Visitor Log Systems and Visitor Log Books keep all visitors names organized with pertinent security information. Visitor ID Kits are an all-inclusive way to keep visitor names organized and provide visitor badges and access. Visitor badges on a roll stick to clothing for instant identification. Ready for immediate and easy use. 2-in-1 visitor pass and log book improves security in your facility and enhances the efficiency of your reception staff. Visitor log book is designed to keep track of visitors and vendors entering your facility. Self-stick paper school visitor badges easily adhere to clothing and help identify visitors in the building. When guests enter your building, it is important for them to have proper identification on them at all times. Additionally, as a business owner you need to track any visitor on your premises in case a theft or vandalism occurs. Visitor & Temporary Badges are the best way to identify guests as such, and track them through the use of log books, etc. 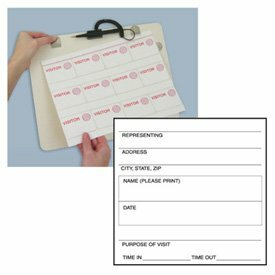 Seton offers Visitor ID Kits, Visitor Log Systems, Engraved Visitor Registration Table Signs and more.